Picture Prompt – Arriving or leaving? This is a picture of Empire flying boat G-AEUC, Corinna, at the Rejaf landing area, Juba. Since independence (July 9th, 2011), Juba is now capital of South Sudan. It’s one of my early scans, at the actual size of the photograph then cropped, and I suspect this is one of the ‘loose’ ones, rather than one inserted and labelled in Geoffrey’s album. 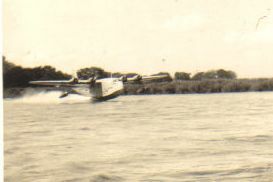 Rejaf was upriver from Juba, above a set of rapids, and a relatively long wide stretch suitable for making a safe landing and departure strip. I expect my copy of the Haynes’ Flying Boat Manual tells me exactly how long the landing strip needed to be – and at higher altitudes it would need to be longer. I remember my father talking about people coming into the Rift Valley lakes and expecting to be able to take at any time, and well laden. That’s when I learnt about thinner air at higher altitudes, which meant planes needed longer run-ups to get up to lift-off. And later in the day, when the air was hot, some planes couldn’t get off at all. I haven’t checked how high Juba is above sea level – although it surely wouldn’t take much to do so these days… there you go, Juba is 518 m or 1699 feet. Rejaf would be higher than that. I checked Nimule in the same website and it is 50m (160 ft) higher. So Rejaf would be somewhere between the two. (the website was dateandtime.info, in case you need it). The question is – is Corinna arriving or departing? When I first started scanning in the ‘boats, I labelled this as arriving. Now I look at it and think it’s departing. On the one hand, with hindsight, there is a series of Corinna arriving at Rejaf, and I think she flew in the other way, i.e. heading upstream. This would make a lot of sense, since the current would help her to stop. Equally, if she’s taking off downstream, the current helps her to build up speed. The other thing is simply something I’ve noticed during the examination of many photos and getting them prepared for the books – the angle of the body (the fuselage). You’ve probably flown in an ordinary plane (and if you’ve flown in smaller planes it’s more noticeable) and been aware of being pressed back in your seat on take-off. It’s a level feeling until the moment when you lift off. When you land, though, the head of the plane is raised; the plane lands like a goose, head up, back feet down. So to me, looking at the angle of Corinna in the photo, she’s taking off. She’s raised her back end up from the water by means of gathering speed, and she’s planing on the underside, with very little contact with the river. If she was landing, her flaps would be down and her whole shape more goose-like. That’s my take on it anyway. And some wise plane enthusiasts will probably put me straight if I’m wrong. I love watching planes take off and land. Especially flying boats. I caught a movie of the Short Sunderland (on the channel ‘moviesformen’) the other day. Interesting comparing the Sunderland with the ‘Empire’ C-class, as it was based on the C-class, but designed for war. They filmed a restored one doing a flight, which was great. I wish someone, somewhere, was restoring an Empire Flying Boat (or recreating one since even the bits aren’t around any more). Leave me a message if you are!